How do you intend to use your kitchen island? Would you use it for sitting and eating, or more for food prep and serving? How much floor space do you have? Kitchen islands range in length from 4 to 5 feet and are often 2 feet wide, so make certain you have space for the island and for good traffic flow. If you don’t have that much space, a butcher block table may be a better option. What features are most important to you? Islands are available with one or many features like closed cabinets, extendable cutting boards, drop leaves, open shelves, drawers, or baskets. Finally, what will best match your décor and personal style? There is a wide array of styles to choose from in a range of colors, finishes and woods. Pick the style that complements your current kitchen cabinets, countertops and flooring. ButcherBlockCo offers a wide selection of Kitchen Islands. Classic Kitchen Island Breakfast Sets expand not only dining space and seating capacity, but serving space. Many come with bar stools to match. 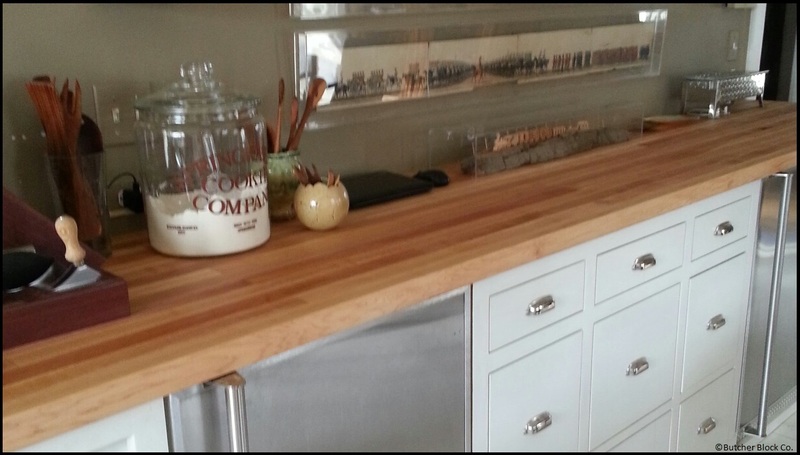 Butcher Block Islands designed to be used as chopping workstations complete with food-safe natural oil finish. They also double as a food buffet and serving space. Many butcher block kitchen islands are available with optional casters to make them portable. Butcher Block Islands with food-safe varnish finish are ideal for food prep and serving. The varnish brings out the wood’s natural beauty and luster. Fine furniture Wood Islands are both beautiful and functional serving islands. Kitchen Island Countertops can also be purchased should you have an existing built in kitchen island you are remodeling. Custom size countertops and custom edging to match your existing countertops can be ordered. The kitchen is the heart of the home, and an island can be the focal point of your kitchen. To learn more about kitchen island options, watch our YOUTUBE Video. The weather is getting nicer, tulips are peeking up through the ground and I am reminded that it really is springtime – even though we still hear of snow storms across the country! This means it is time for “spring cleaning”! I may be an odd duck, but I actually find cleaning to be a bit cathartic. When I am stressed I end up cleaning my kitchen to feel better. Maybe it is a control-thing. Please tell me I am not the only one who feels this way? So I thought it an appropriate time to share some butcher block care and cleaning tips for your kitchen. My close friend, who spends a lot of time cooking and baking, was really surprised to hear that plastic cutting boards are less sanitary than wood cutting boards. This learning has been blogged about and shared online for many years. But if you have never heard of it, or need to be reminded of it again, here is the scoop. For a long time it was believed that wood butcher blocks and cutting boards were more likely to harbor dangerous levels of bacteria; given that wood is porous, it would soak up juices from raw meats, allowing bacteria to seep down into the board. And this bacteria could pose a risk of contaminating the next food item placed on the cutting board. Plastic, because it is non-porous, was believed to be resistant to this bacterial invasion. While it may not be entirely clear, research has shown that wood boards were actually more sanitary than the plastic boards. It is believed that bacteria can get lodged in the nicks and gouges that form on a plastic cutting board. High quality wood butcher blocks – made from Hard Rock Maple and other premium hardwoods – are more resistant to this type of knife damage. Additionally, the wood used to construct these butcher block countertops, kitchen islands, kitchen carts, and cutting boards appears to have natural germ-killing properties which are not present in plastic! Separate your Food – The Partnership for Food Safety Education recommends using one cutting board for fresh produce and a different cutting board for raw meat, poultry and seafood to prevent cross-contamination. We agree! Wash Immediately – After use, always wash your cutting boards or chopping block with hot soapy water and dry with a clean towel. Sanitize – Especially after exposure to raw meat. It is pretty easy to use 1 Tablespoon unscented chlorine bleach in one gallon of water. If you prefer, use straight white vinegar instead of diluted bleach solution. Dry – Set cutting boards on edge to air dry completely. At ButcherBlockCo we like to tout the many benefits of hardwood cutting boards and butcher blocks, and being more sanitary than plastic is one of our favorites.